Chittagong, Dec 3 (Just News): One of the transport owners' associations of the district enforced an indefinite strike in the port city on Sunday morning to press home their 11-point demand, causing immense sufferings to commuters. 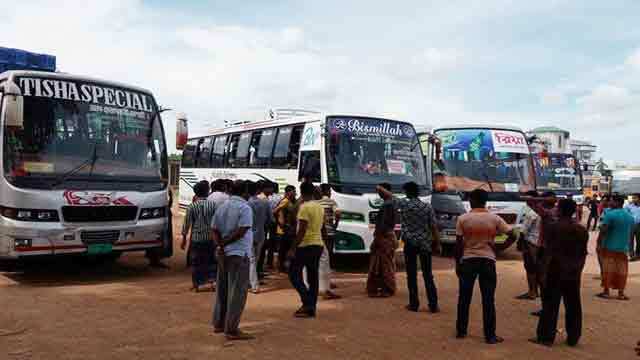 Public transports, including buses, minibuses and human-haulers, stayed off the roads since morning in response to the strike called by Chittagong Metro Public Transport Owners' Sangram Parishad. Belayet Hossain, convener of the transport owners' platform, said around 1,500 vehicles will stay off the city streets until the administration meets their demands. Their demands include ending harassment of transport workers by police, relaxing driving license issuance rules and taking unfit vehicles off the roads. Thousands of commuters in the city are facing immense sufferings following the transport strike. CNG-run auto-rickshaw drivers and rickshaw pullers are charging excessive fares taking advantage of the situation, alleged commuters.